(The Root) — Every presidential administration has one or two moments it is best remembered for — some good, some bad. President Nixon will always be better-remembered for Watergate and his final farewell wave following his resignation than for any of his policies. President Obama will always be remembered for the night he made history by becoming our country's first black president. But he will also be remembered for his wife. While other presidential first ladies are largely forgotten, or remembered for advocacy on a singular issue, like Nancy Reagan's "Just say no" campaign, Michelle Obama will rival her husband in America's collective memory. Her "Let's Move" fitness campaign may be her official issue platform as first lady, but it will not be her greatest legacy. Her greatest legacy will be permanently redefining the American ideal for femininity, beauty and womanhood, and her appearances in Vogue magazine will be remembered as central to this. The fashion industry as a whole has faced growing criticism in recent years — from feminists, health experts, nonanorexic readers and even successful models — for its increasing use of models who seem to be shrinking more with each passing year. In addition, the industry has faced criticism for its lack of diversity. In 2010, when actress Halle Berry landed the September cover of American Vogue, considered the most important of the year, she was only the second black woman to do so in 20 years. And yet as excited as I was to see a beautiful woman of color make the cover, Berry's selection highlighted one of the fashion industry's other dirty little secrets behind sizism and racism: colorism. 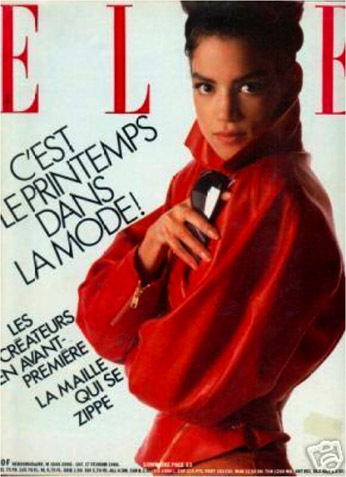 Contrary to folklore, the first black woman to appear on a Vogue cover was not brown-skinned Beverly Johnson but ethnically ambiguous-looking, although African-American, Donyale Luna, who graced the magazine's British cover eight years before Johnson became the first black cover model for American Vogue in 1974. The use of models of color who don't exhibit all that much color has been a constant throughout the industry for decades, with darker models like Alek Wek and Kiara Kabukuru being exceptions more than the norm. Fairer-skinned beauties, like Veronica Webb and Lana Ogilvie, ruled the '90s. Even those brown-skinned beauties who broke through with a vengeance, like Naomi Campbell, were celebrated for their multiracial backgrounds and features. Campbell's eyes have been credited to her Chinese ancestry, while her successor Chanel Iman's beauty has been credited in part to her Korean heritage. I once heard a fashion expert remark about Beverly Johnson's nose helping her "make it" in the industry. I had never noticed her nose but did after this. It is arguably thinner than the features traditionally associated with African Americans. But unlike a model who may be hot today and gone tomorrow, Michelle Obama has emerged as American fashion's most bankable face of the last half decade. Few models enjoy one Vogue cover, let alone two. Even fewer black women who aren't models land two covers — with A-list stars such as Beyoncé and Berry, both of whom are light-skinned, being notable exceptions. Years from now, few will remember what President Obama said in his most recent State of the Union address, or the critiques of his Republican opponents. But some little girl will come across a copy of Michelle Obama's Vogue magazine covers, presenting her in all of her dark-brown-skinned, full-lipped glory, and see herself and know that she is as beautiful as an American first lady. Almost as important, some people who don't look like that little girl will have learned to appreciate her brown beauty, too, thanks to Michelle Obama.